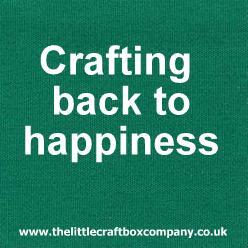 The Little Craft Box Company: Crafting makes me happy! What makes you happy? Crafting makes me happy! What makes you happy? My hobbies have always been creative involving art and crafts, music, sewing and knitting. Not forgetting my most wonderful creations -my three beautiful, talented children!!! I find that doing something productive, in which you create something that you can see, touch or hear at the end of it, is incredibly beneficial to your well-being. When I get a bit down in the dumps I create. Having rows of beautiful beads I've made, or a new sewing kit or learning a new chord on my guitar makes me feel really good about myself again. You don't have to be Van Gogh, Madonna or Kirsty Allsop to be creative! So why not try one of my Creative Workshops? It might just be what you need.